We present our participatively and iteratively designed 3D audio-tactile globe that enables blind and low-vision users to perceive geo-spatial information. Blind and low-vision users rely on learning aids such as 2D-tactile graphics, braille maps and 3D models to learn about geography. 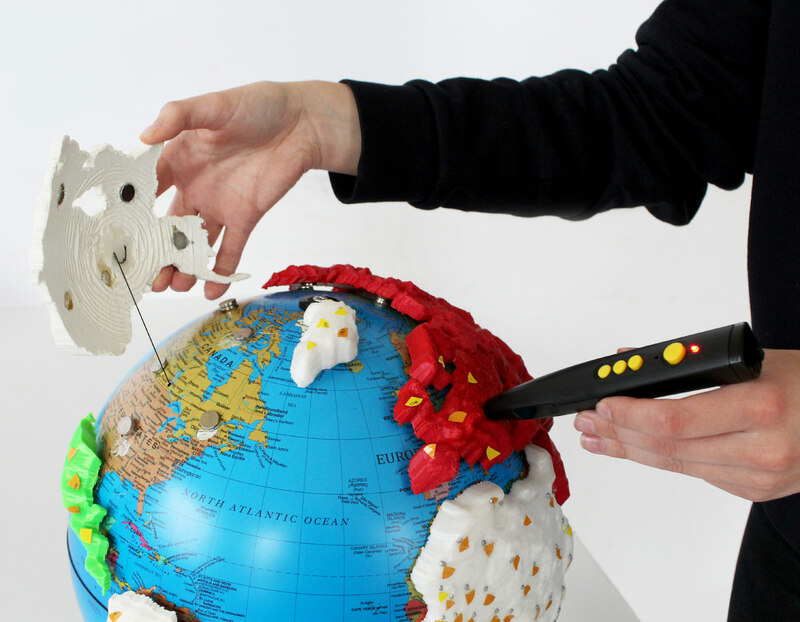 We employed participatory design as an approach to prototyping and evaluating four different iterations of a cross-sensory globe that uses 3D detachable continents to provide geo-spatial haptic information in combination with audio labels. Informed by our participatory design and evaluation, we discuss cross-sensory educational aids as an alternative to visually-oriented globes. Our findings reveal affordances of 3D-tactile models for conveying concrete features of the Earth (such as varying elevations of landforms) and audio labels for conveying abstract categories about the Earth (such as continent names). We highlight the advantages of longitudinal participatory design that includes the lived experiences and DIY innovations of blind and low-vision users and makers. Read more about Innovative Designs for Accessibility Competition | Opens November 1st! For up to date information on the scheduling, or to register, visit the Code4Lib North wiki. Read more about Code4Lib North: the Ninth. Jutta Treviranus is the Director of the Inclusive Design Research Centre (IDRC) and professor in the faculty of Design at OCAD University in Toronto (http://idrc.ocadu.ca). With its origins in the ATRC, which she launched in 1993, Jutta has established the IDRC as an international center of expertise in the inclusive design of emerging digital systems, networks and practices. Jutta also heads the Inclusive Design Institute, a multi-university regional centre of expertise (http://inclusivedesign.ca).